What do you do when you see a kid crying in public? Before you answer the question – Did you hear about the mom who punched the hipster girl in a parking lot of a Nordstrom Rack? It sounds like the set up of a joke but it really happened. I’m not saying it’s right, I’m saying that maybe she had it coming. Again, I’m not one to condone violence but I’m on the fence about this. Because I don’t know how I’d react if someone told me to quiet my kid. I’ve had to deal with my kid crying in public and it’s never easy. Like the time when I had Norrin had a major meltdown and we had to take two buses to get home. People stared, shook their heads. One man got up from his seat and moved further back. Another woman kept looking back at us every few minutes, glaring with disapproval. Or like that time while on vacation, Norrin started crying in a fast food restaurant and I yelled at a table of men who were staring at my kid cry. And let’s not forget about THE MOTHER OF ALL MELTDOWNS on our JetBlue flight. Having people stare, doesn’t make it any easier. But sometimes, strangers are kind. And when they are – I am so incredibly grateful. But never, not once during a public meltdown has someone asked me to calm my kid down. I don’t believe the kid crying at Nordstrom Rack had any kind of special need but ALL kids cry. And sometimes it’s not so easy to get them to stop. And sometimes parents are so tired, worn out, over it, frustrated – that they let their kid cry. Because they know, at some point, the crying will stop. Sometimes it’s more exhausting to get them to stop, sometimes it’s easier to let them work it out on their own. I say this because I have been that parent many times over. 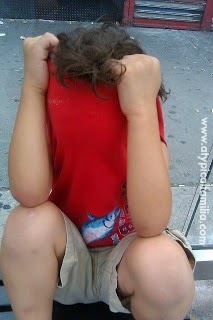 At almost nine years old, Norrin still has meltdowns in public. I have learned to tune out the tears. I’ve learned that not every second of our day is a teachable moment. And during a meltdown – it’s nearly impossible to reason with him. I do my best. And if he’s still crying after I’ve done my best, well – he’s on his own to get over it. So the next time you see/hear a kid crying in public – don’t stare, don’t comment – just go about your business. You don’t know the circumstances – you just see one instance. The parent is well aware their kid is crying and believe me when I say – if they could get their kid to quiet down easily, they would. And if you do feel compelled to tell a parent what to do with their kid – be prepared to pay the consequences.